Making histological sections for the light microscope. For light microscopy, three techniques can be used: the paraffin technique, frozen sections, and semithin sections. The paraffin technique is the most commonly used. Once the sections are prepared, they are usually stained, to help distinguish the components of the tissue. Unstained, it's hard to make out much detail, because the optical density of the different tissue components is very similar. Section are prepared for the electron microscope using a method similar to that for semithin sections. What is the paraffin technique? In this technique, tissues are fixed, and embedded in wax. This makes the tissue hard, and much easier to cut sections from. The sections are then stained, and examined with the light microscope. The chemical added binds to and cross-links some proteins, and denatures other proteins through dehydration. This hardens the tissue, and inactivates enzymes that might otherwise degrade the tissue. Fixation also kills bacteria etc. It can also enhance tissue staining. The fixative most commonly used is a 4% aqueous solution of formaldehyde, at neutral pH. To cut sections, the tissue has to be embedded in paraffin wax, but wax is not soluble in water or alcohol. However, it is soluble in a paraffin solvent called 'xylene'. Therefore, the water in the tissue needs to be replaced with xylene. To do this, first the tissue has to be dehydrated, by gradually replacing water in the sample with alcohol. This is achieved by passing the tissue through increasing concentrations of ethyl alcohol (from 0 to 100%). Finally, once the water has been replaced by 100% alcohol, the alcohol is replaced with xylene, which is miscible with alcohol. This final step is called 'clearing'. The tissue is placed in warm paraffin wax, and the melted wax fills the spaces that used to have water in them. After cooling, the tissue hardens, and can be used to cut slices (sectioned). 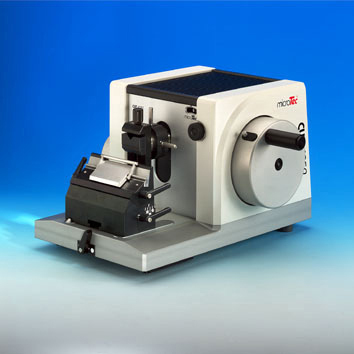 The tissue is trimmed, and mounted on a cutting device called a microtome (shown in the picture). Thin sections are cut, which can be stained and mounted on a microscope slide. Unfortunately, most staining solutions are aqueous, so to stain the sections, the wax has to be dissolved and replaced with water (rehydration). This is essentially step 2 in reverse. The sections are passed through xylene, and then decreasing strengths of alcohol (100% to 0%) and finally water. Once stained, the section is then dehydrated once again, and placed in xylene. It is then mounted on the microscope slide in mounting medium dissolved in xylene. A coverslip is placed on top, to protect the sample. Evaporation of xylene around the edges of the coverslip, dries the mounting medium and bonds the coverlips firmly to the slide. Are there any other ways of making sections for the light microscope? Tissues are frozen rapidly in liquid nitrogen, and then cut in a refrigerated cabinet (a cryostat) with a cold knife, then stained and observed in the microscope. This procedure is faster, and can preserve some tissue details that may be lost by the paraffin technique. Sections are 5 - 10 µm thick. It is sometimes hard to see detail in thick sections. To get around this, sections can be embedded in epoxy or acrylic resin, which enable thinner sections (less than 2 µm) to be cut.